School teachers looking for materials to support their professional development and improve their classroom practices are usually disappointed as appropriate materials are scarce in the market. This is more so with teachers of mathematics, where, paradoxically, the need is the greatest. 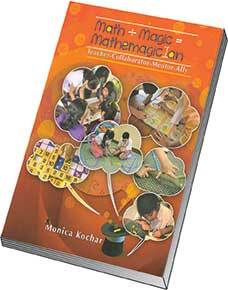 So the expectations are naturally high when one picks up a book with the cryptic title Math + Magic = Mathemagician. The author has a vast experience of direct classroom teaching. She has taught in well-known schools across the country and has practised innovative approaches to teach maths throughout. This book resembles a handbook that takes the reader through classroom management, to teacher-student relationship, activity planning, hand-holding the children, and even evaluation. You will find detailed descriptions of the true nature of the relationship between the teacher and the taught, and on how to achieve those teaching and learning objectives. But it is not clear whether the book is a guide to a practising teacher or a documentation of a creative and committed school teacher’s personal journey. The mathematical concepts, theoretical rigour, and hands-on activities available in the book are rather limited and unlikely to provide many original ideas and unique stimuli to the readers. For instance, the author says, “Geometry and crossword: A fun way to make the topic fascinating is to create a crossword on geometrical words as part of the chapter (p.24)”. I beg to differ! While such activities would add an element of novelty and increase the curiosity, they do not contribute much to conceptual understanding. But, the book does have useful pointers like “Decimals and story” (p.25) and teachers can adopt them meaningfully using the example provided. The sections on classroom management, relationships, material design and display are also useful and relevant. The chapter “Management of class with love” may look like an atypical section for a mathematics teachers’ handbook. But it really touches upon some important points missing in our schools. While, a new teacher is bound to benefit from the description and the available tips, there are some aspects that are inadequately covered (e.g., How to deal with pending work; attention deficit …on p. 50). The narrative is crisp and smooth flowing through the chapters and the presentation including the graphic design is attractive and appropriate. In summary, it is a good attempt at providing much needed ideas to a mathematics teacher in our schools and succeeds partially in doing so. Teachers keen to add novelty to their teaching and explore new ways to approach the children may want to take a look at it. The reviewer is a Math resource person involved in training school teachers for over two decades. He lives in Mysore. He can be reached at sngananath@gmail.com.